It is a web app: accessible via the Web browser, using a short URL. It does not need to be downloaded and installed from an app store. It can be generated in several languages. A language selector allows users to view it in their preferred language. It can be viewed on a desktop computer, a laptop or a handheld device, including smartphones. It can be viewed online or offline. 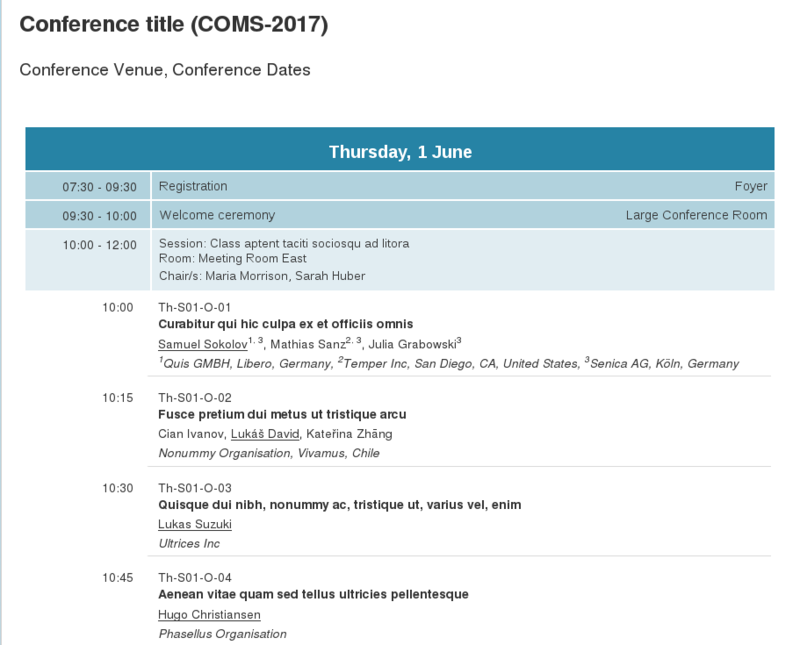 It is generated and updated by the conference organisers, at the press of a button, on their account. It is self-contained: it can be dowloaded by the conference organisers as a zip file and can be deployed on their website or on a USB key. A copy is always hosted on the COMS server, at https://coms.events and can be directly accessed at any time. On request, access can be protected by a password. The programme can be browsed filtered and searched. Presentations can be bookmarked on a calendar and exported. It comes with its own search engine, allowing a full-text search of the abstracts. 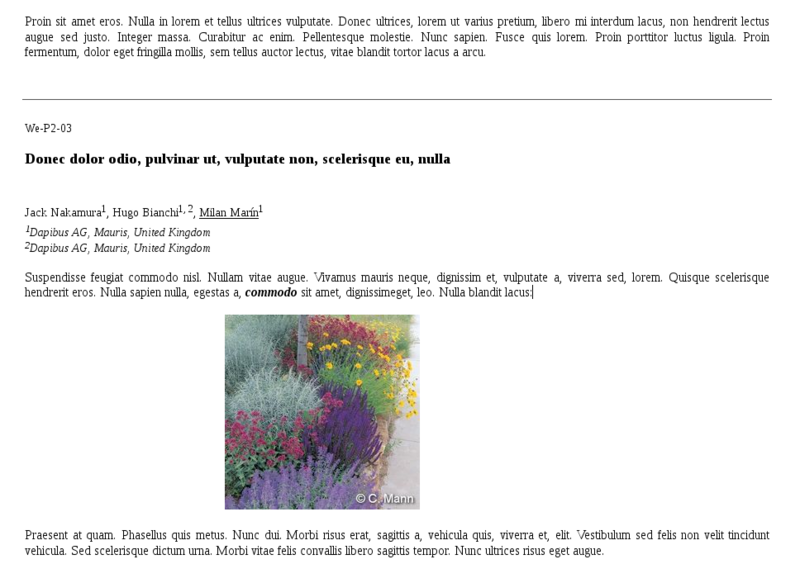 A cover page and a footer, suitable to list sponsors, for instance, can be created. Full papers, extended abstracts and presentations can be included. Input key data into the system (e.g. 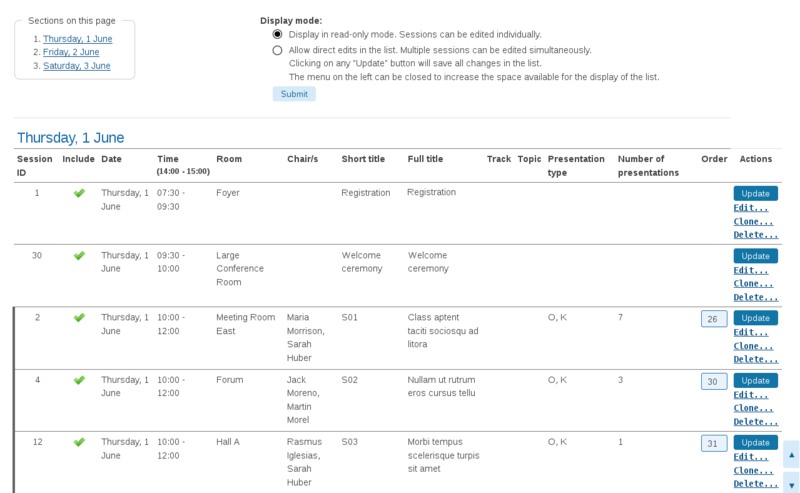 list of rooms, time slots for various types of presentations, list of sessions chairs). These data are later used when defining the sessions. Optionally, define a template to generate unique codes to identify the sessions and presentations (e.g. 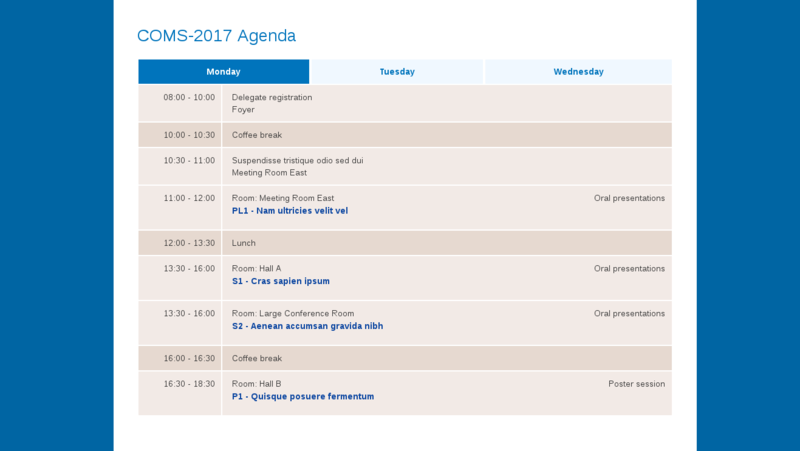 "Tu-S12-P" will identify poster session S12, on Tuesday; "Tu-S12-P-05" will identify poster 5 of that session). 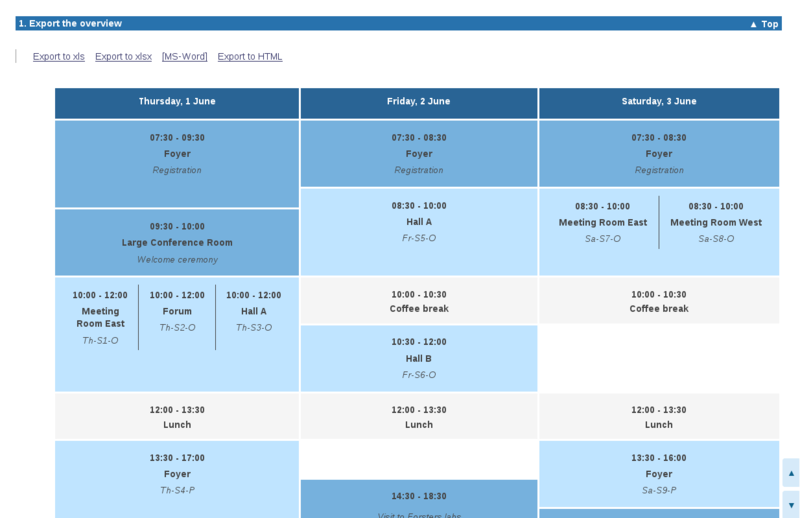 Define the sessions: input session titles, codes, rooms, dates, times, chairs and other organisers. 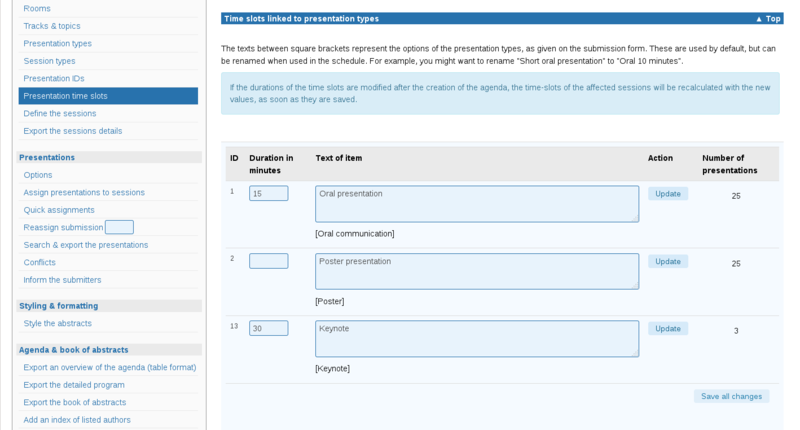 Optionally, add constraints on the topics and presentation types that will be used in the sessions. 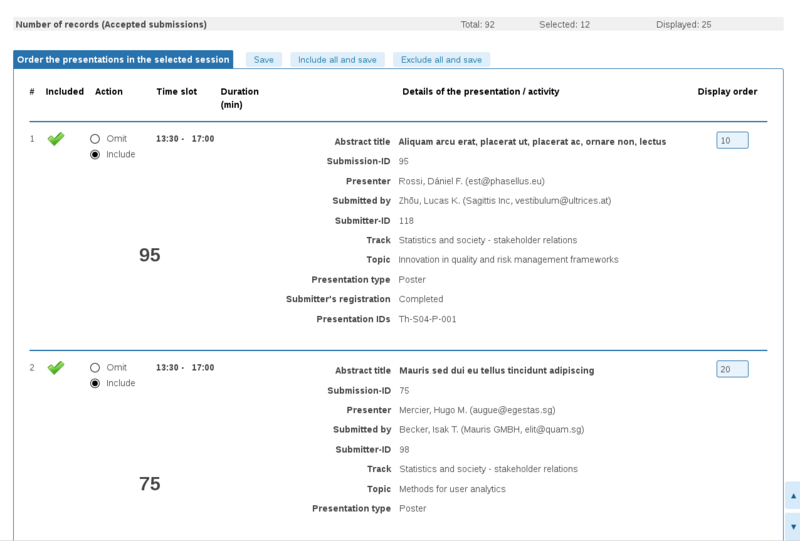 You can define parallel sessions and time slots without presentations (e.g. 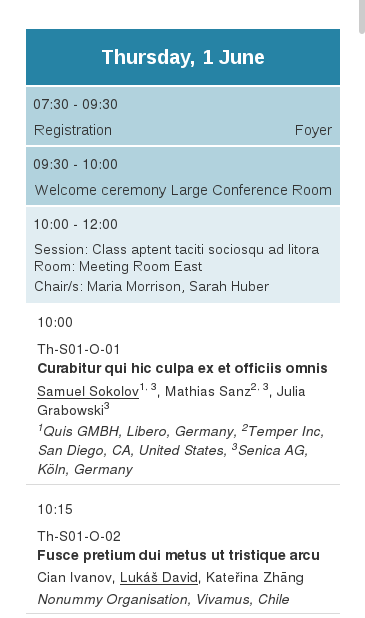 ceremonies, coffee breaks, conference dinner). Insert and order presentations into the sessions. If constraints have been set, they will be used. For example, a poster session will only list posters as candidates to insert into that session; the program will not allow multiple presentations of a submission if this constraint has been set. Check for conflicts in the schedule and correct as appropriate. When the program is ready, display the details of each presentation on the speakers' accounts. Alternatively, email the details to the speakers. Export an overview of the agenda in table format. Export a detailed view of the sessions that includes the title and authors, as well as information about the sessions. Export to HTML or MS-Word. Optionally, add an index of authors. Export a browsable agenda to HTML. The export can be hosted on COMS servers and accessed through a link. Alternatively, it can be downloaded as a zip and posted on your own site. This export can contain any available data (text of the abstracts, files to download). Functions are provided to format and style the exports. Option 2: export a detailed view of the sessions that includes the title and authors, as well as information about the sessions. Export to HTML or MS-Word. Optionally, add an index of authors. An export that is performed independently of the agenda. In this case, the presentations can be ordered manually or be ordered according to predefined rules (e.g. by alphabetical order of the first author). Export to HTML or MS-Word. 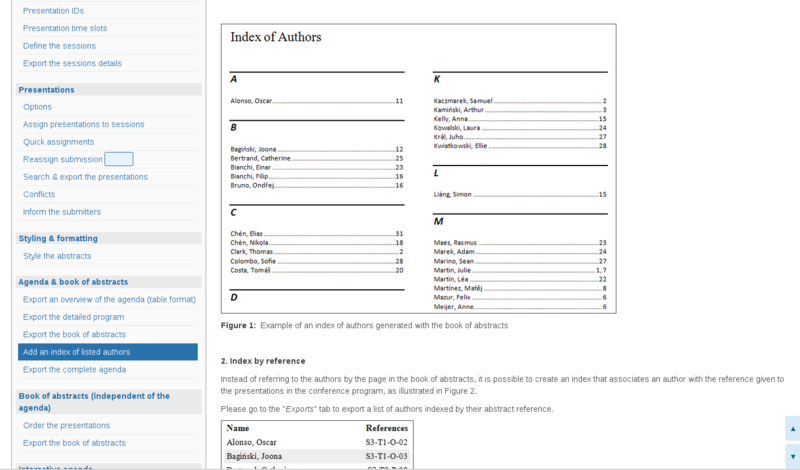 Optionally, an index of authors can be added. Functions are provided for styling and formatting. Export individual abstracts to MS-Word or PDF. Functions are provided to style and format the abstracts. Download submitted files (extended abstracts, full-papers, presentations). Filters are provided to select the files to download or export.